IROCK launches the TC-15CC tracked closed-circuit plant, which offers high productivity in a small footprint. IROCK Crushers, a leader in global sales of mobile screening and crushing equipment, introduces its TC-15CC tracked closed-circuit crushing plant, ideal for small to medium contractors. The unit boasts a relatively small footprint and is easy to maneuver from job to job or around the site. The new crusher features a large capacity hopper for loading material with large wheel loaders and excavators. Its new apron release system minimizes material blockages, which enhances uptime. The TC-15CC can process a variety of soft to medium hardness materials, such as concrete, gravel, rock and sand to produce uniform, cubical product. IROCK’s hydraulically adjustable aprons are remote controlled and provide optimal management over material sizing. The remote-controlled apron release and the unit’s large crusher opening allow the operator to remove material blockages from the machine’s cab, which means less downtime and more productivity. 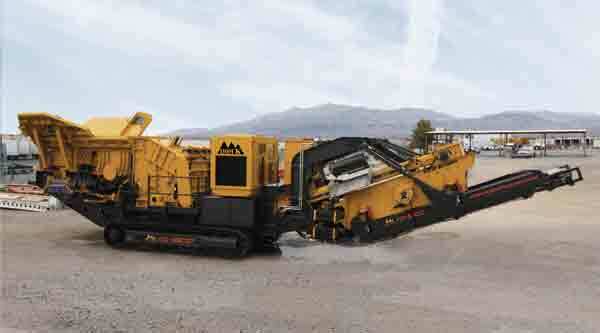 The track crusher features a fixed, Hardox hopper with fold-up wings to deliver a 15-cubic-yard capacity. It is paired with a 40-inch vibrating grizzly feeder, which has 3/4-inch AR 400 liners on the pan and sidewalls. Producers can set up the TC-15CC to produce as many as four products or just one for optimal productivity. The 5-foot by 12-foot heavy-duty, high-energy screen works with two side-transfer conveyor belts for producing the multiple products. Users can simply rotate the return conveyor out to make the fourth product or keep it in place to return the oversize to the crusher to be re-crushed. The ability to return the top and bottom deck materials to the crusher enables as much as 20 percent more production than competitors’ machines. The boosted efficiency equates to greater production in less time, reduced labor costs, less fuel consumption and lower operation expenses. This feature is ideal for applications such as asphalt recycling, where contractors commonly need a consistent half-inch product. The return conveyor is mounted on a hydraulic swivel, allowing producers to use the conveyor for stacking material as high as 16 feet. The TC-15CC also features a 44-inch by 5-foot double deck pre-screen that incorporates heavy-duty grizzly bars on top and screen media on the bottom. The screen media removes fine material before it enters the impactor and routes the material through the unit’s bypass chute. With this chute, fines that fall through the grizzly feeder can either bypass the crusher and mix back in with the crushed material or be removed via the dirt conveyor by making a simple adjustment to the flop gate. IROCK designed the closed circuit plant with a four-bar rotor that provides maximum production. Producers can remove the blow bars, then flip and re-install them for a second lifecycle. The TC-15CC incorporates IROCK’s exclusive ROCK BOX, an innovative alternative to discharge chutes found on similar units. The ROCK BOX uses a shelf system with abrasion-resistant wear bars that allow crushed material to build up. This material acts as a wear liner, which cuts down on costly labor and replacing wear parts. As material exits the impactor, it moves over the unit’s vibratory pan feeder. This reduces the risk of ripping a belt when running recycled materials that may contain rebar. The pan feeder directs material onto a 48-inch-wide screen feed conveyor, allowing for maximum production from the crusher. The 48-inch-wide discharge conveyor can be hydraulically raised or lowered for easy maintenance. The TC-15CC is highly portable, with 20-inch track pads for easy maneuverability around a site or onto a trailer for transportation to other locations. IROCK designed the TC-15CC’s screen box as a modular unit so it can be quickly detached for compliant transportation through any U.S. state. The unit comes standard with a wireless remote control that operates the plant and tracking system, while a user-friendly operator station controls the CAT power unit as well as all crusher startup and shutdown functions. Manual hydraulic control valves manage the set-up functions. Like all its equipment, IROCK designed the TC-15CC to perform with minimal electrical components. This enhances dependability and minimizes downtime associated with programmable logic controllers, or PLC, systems. To reduce cleaning and control dust, the TC-15CC features a standard dust-suppression system while catwalks provide convenient access to crucial maintenance and cleaning points.